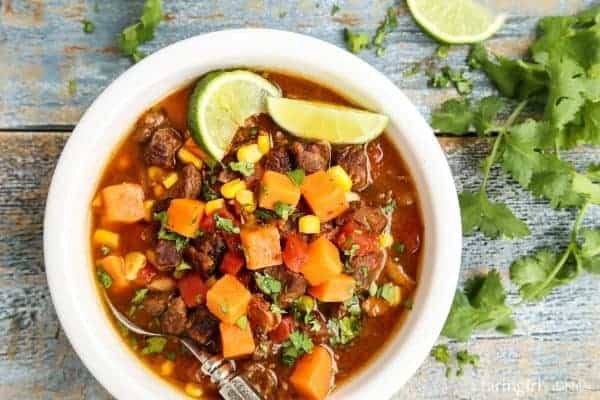 This Slow Cooker Beef and Sweet Potato Soup is pure comfort. But it’s the lime that puts a little different twist on this hearty meal, adding a fresh, bright quality that I can’t get enough of! We’ve been having such incredible fall weather this year in Minnesota. Sunshiny and so nice and warm for mid-November. On Sunday evening, our family played several games of lightning out on the driveway…in shorts and t-shirts! The only thing that forced us inside was the sun going down. Darkness and trying to shoot a ball into a hoop just don’t mix. But I heard the “s” word yesterday. Apparently we’re in for an abrupt chill-down at the end of the week, and there’s a chance for heavy snow. Time to take the boots and gloves out of their hiding place at the back of the closet. 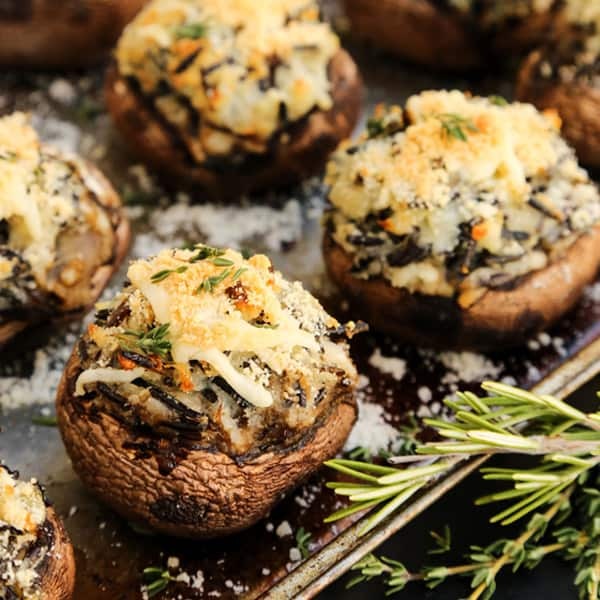 When the temps turns chilly, my meal planning turns to warm comfort food. And many times that means utilizing the slow cooker to make a big pot of soup. Our family is always up for soup. This Slow Cooker Beef and Sweet Potato Soup is hearty and delicious, with a fun new twist of bright lime flavor. I hope you like it as much as we do! * This is a sponsored post, created in partnership with Red Gold®. This soup’s base consists mainly of beef broth, plus beautiful Red Gold® diced tomatoes. These tomatoes are of the highest quality, bursting with fresh tomato flavor. 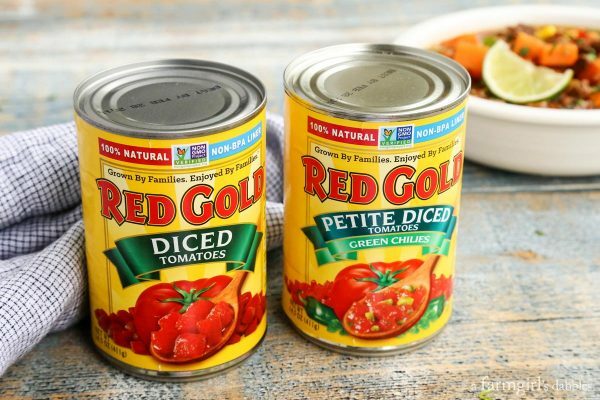 If you look in our pantry, you’ll find a variety of Red Gold products. These are the tomatoes I seek out when buying groceries for our family. Besides just plain liking the Red Gold products, I also appreciate that the tomatoes are sustainably grown on Midwest family farms, made by a family-owned company. Sweet potatoes have been the “it” fresh produce at our fall table. Our youngest daughter recently declared how good they were at supper one evening. So I’ve taken off with it, incorporating their goodness whenever I can. Our girls can easily make their way around the kitchen, cooking and baking right alongside Blake and me. We started Hatti and Tessa (now 14 and 9 years old) out with simple tasks when they were still in their high chairs and standing on stools at the counter, so their level of comfort in the kitchen has been a natural progression over the years. We’ve always encouraged them to learn new things, teaching them tasks appropriate to their abilities, nudging them on to more and more responsibility. How else will they learn? Being able to plan and create meals from scratch is a life skill that we’re happy to help our girls learn and hone. 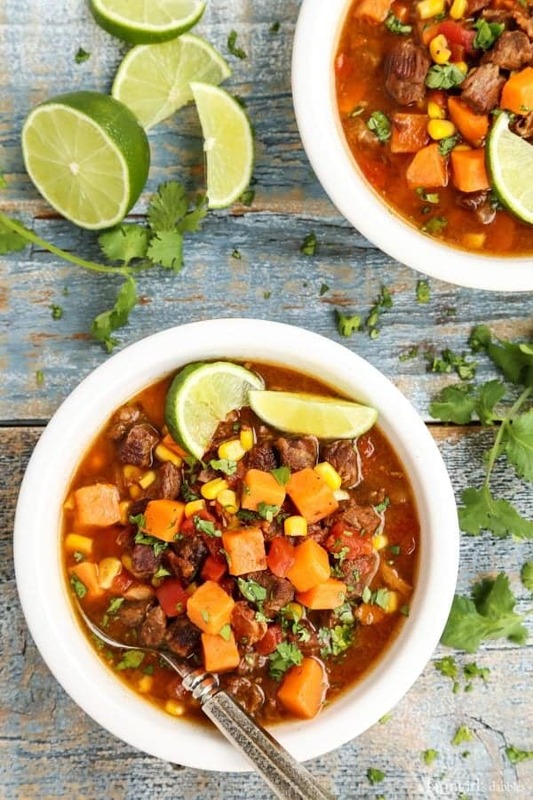 Our whole family gets involved when we make this slow cooker beef and sweet potato soup recipe. 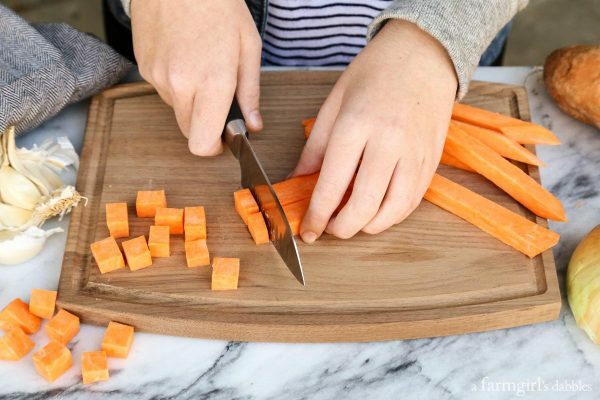 In the picture above, Hatti is dicing the sweet potatoes after I had sliced them into long strips. Sweet potatoes can be a little hard to maneuver when they are whole, as they are pretty hard and have a rounded shape. It won’t be long though, and she’ll be peeling, slicing, and dicing those delicious veggies from start to finish. Tessa always volunteers to mince the garlic. She prides herself in how small she can chop it. Blake chops the onions because he has eyes of steel (I cry like a baby!). And then we all chip in to accomplish the rest, crossing off items as we go down the recipe. It’s been fun to watch our girls’ interest in the kitchen deepen and their skills sharpen. They’ve gone from banging measuring cups and wooden spoons on their high chair while I’m making supper, to printing off a recipe and being able to execute it from start to finish with little more than a question or two about an ingredient or technique. 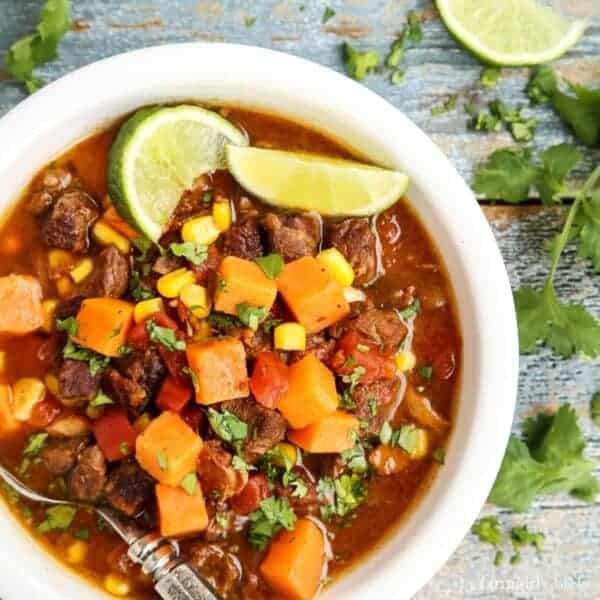 I’ve enjoyed many different versions of chunky beef soups (be sure to check out my Slow Cooker Beef and Barley Stew), but I have to say that this is the one I’ve had the most fun with. I love the rich tomato flavor that melds so wonderfully with chili and cumin, plus the sweet bites of sweet potato and corn. But it’s the lime that puts a little different twist on this hearty meal, adding a fresh, bright quality to the overall feeling of comfort. Combined with a little fresh chopped cilantro sprinkled over the top, this soup definitely shows off a bit of Southwestern flair. Heat a large skillet over medium to medium-high heat and cook the bacon until chewy-crisp. Remove bacon to paper towel-lined plate to cool, and then roughly chop. Sprinkle beef with salt and pepper, and then sear beef in two separate batches, just until nicely browned on all sides. Transfer beef (leave excess fat in the skillet) and bacon to a large slow cooker on high heat. (If using a slow cooker like I own – the Cuisinart Cook Central Multi-Cooker – simply cook bacon and beef right in the cooker. Drain off fat once beef has cooked.) Stir in garlic, onion, chili powder, and cumin, and sauté until onion starts to soften, about 3 to 4 minutes. Add both cans of diced tomatoes (with the juice), beef broth, and soy sauce. Cover and cook for 4 hours on high heat. Stir in sweet potatoes, and then cover and cook for 2 hours more, or until sweet potatoes are tender. Stir in corn, cover, and cook for 10 minutes. Stir in fresh lime juice right before serving. Offer lime wedges for squeezing over individual bowls of soup for even more bright lime flavor. Finish with a sprinkling of fresh cilantro. Be sure to check out Red Gold on their website. You can also find them on social media on Facebook, Twitter, Instagram, and Pinterest. This post is sponsored by Red Gold. I am happy to be partnering with them again this year, bringing you delicious recipes bursting with fresh, rich tomato flavor. All opinions are 100% my own. Thank you for supporting the brands that help make this site possible. 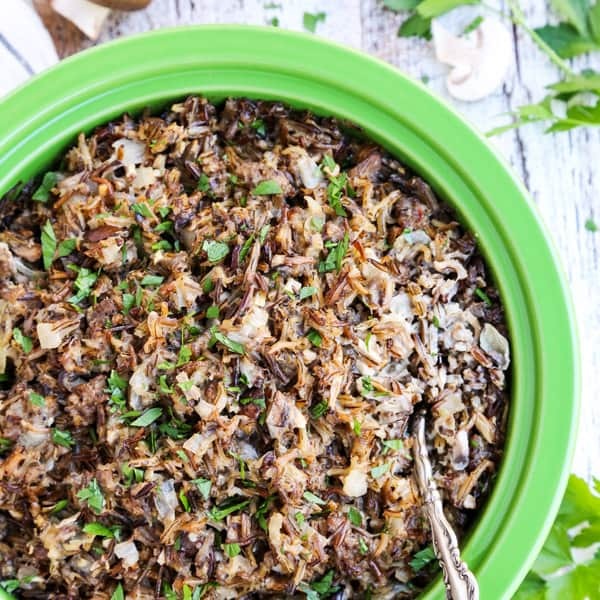 I will get the slow cooker pot out just for this yummy recipes! This is going on my to-do short list! Great idea! 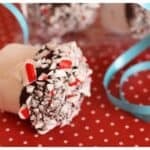 Fun to make and more fun to eat. 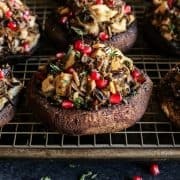 This looks so delicious and so filling! My family would love this one! They’re talking about snow here too! 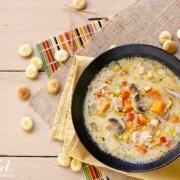 I need to cozy up with a bowl of this soup this weekend! 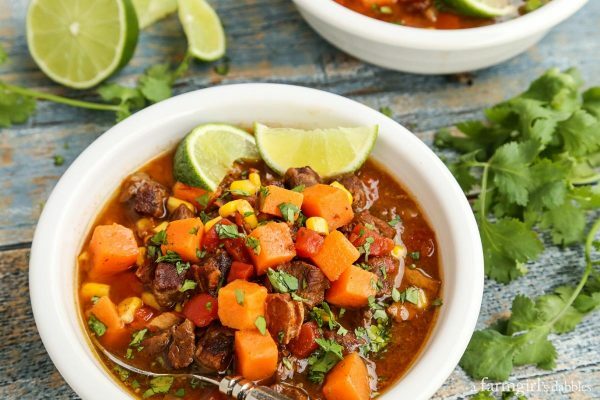 I am loving the idea of adding sweet potatoes in this stew. We probably won’t get any snow until like February but it’s been getting cooler here in the evenings. I love it though. Looks like I need this soup to keep us warm. Colors are great and I can’t wait to taste this. hey girl this looks so yummy! I was always in the kitchen with my Mom growing up to! So much fun!